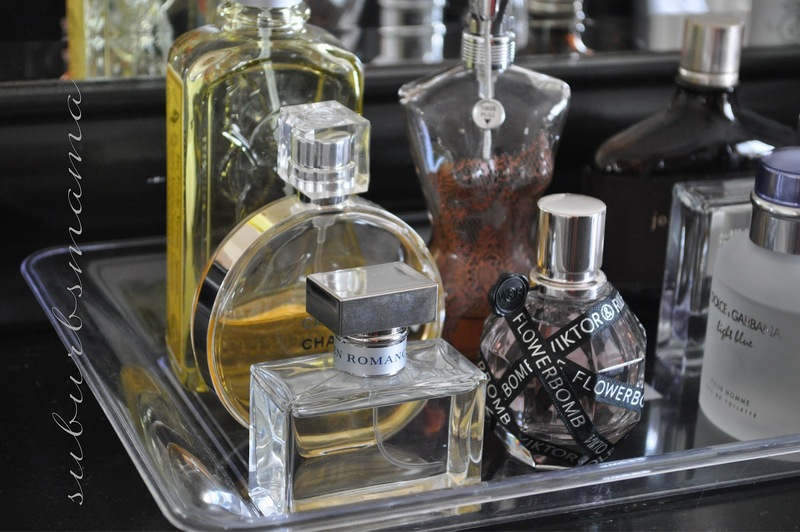 Suburbs Mama: What's on my perfume tray? I am pretty picky about my perfume. So when I find a scent I like, I will stick to it. In fact, all of the perfumes I have right now have been repurchased over and over again. You may notice that I do not own any celebrity fragrances or body sprays. I feel that I would rather spend the money on a good perfume, rather then spend my money on cheap perfume/body sprays. L'Occitane Citrus Verbena: My one and only spray I use for the spring/summer. It smells like fresh sliced lemons sprinkled with sugar! I am going to have to repurchase this again really soon as I am running low again. Chanel Chance: I Love this perfume. It is flowery but subtle. I can wear it during the day or night. Jean Paul Gaultier Classique: This perfume is a mixture of rose, orchid and vanilla. It is smells amazing. This must be my third bottle. Victor & Rolf 'Flowerbomb: This perfume is mixture of flowers and tea, it is a very pleasant and clean smell. This is my second bottle. I try to use it very sparingly since it is probably the most expensive perfume I own. The only other perfume that I can think of, which I want back in my collection is the Stella by Stella McCartney, it is one of my favorites, It is a mixture of rose and amber. I have already gone through two bottles of it and would love another one :) Hopefully hubby will get me one for my upcoming birthday. These are some samples which I liked. Samples are a great way to try our perfume without buying the whole bottle. Most of these are from Birchbox, but you can go to the fragrance counter and ask for samples. Well, that is my very modest perfume collection. Have you tried any of these perfumes? Leave a comment and tell me what your favorite perfume? 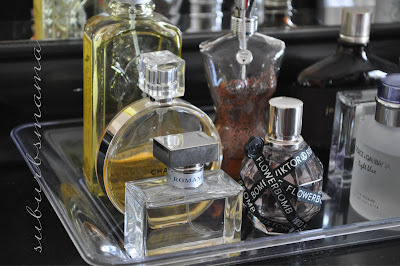 I love looking researching the notes in my favorite perfumes and seeing what they have in common. 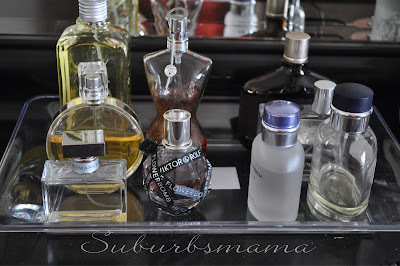 My favorite perfume right now is Bulgari Jasmin Noir; I also wear Balenciaga Paris very often, Dior Addict rarely, and LaVanila Pure Vanilla roll-on for days at the pool. I am going to try the L'Occitane one because that sounds like the perfect scent. yes, do try the L'Occitane, let me know if you like it. I have a lot of these perfumes and I adore Vera Wang.